As the winter sun burns away the morning mists and melts the surface water of dykes and ditches, a landscape full of life and history is revealed. This remote, flat countryside, criss-crossed with waterways, long beaches and tidal creeks, is Romney Marsh. To the east, the English Channel falls off the horizon, to the south the 10-mile coastline gently curves from the village of Dymchurch round to the 135ft (41m) High Light Tower at Dungeness. Inland, to the north and west, is low-lying wetland veined with watercourses. This is the largest coastal wetland on the south coast. It relies for its existence on the constant upkeep of its drainage system and massive earthen defence walls. These, together with natural shingle barriers, protect it from incursions of the sea as it tries to reclaim the land it once covered. It is water which has given Romney Marsh its dramatic history of smuggling, its abundant wildlife and its rich and fertile land. Nature and man have worked in unison to create this landscape. On the seashore, waves crash on the shingle, as the winter wind whistles across the land. Inland, large flocks of resident and migrating waterfowl congregate noisily on the ground. Marsh harriers slowly circle in the great expanse of sky above the flocks of sheep whose forebears were responsible for the area’s past wealth. Sheep have been grazed on Romney Marsh for centuries. The marsh, however, has a bad reputation for health, with malaria, known as ague or marsh fever, a significant problem well into the 1800s. The sheep’s owners stayed away from the area, preferring to employ shepherds, called lookers, to tend the flocks. The last lookers disappeared after the Second World War when much of the land was ploughed. Only around a third of the pastureland remains, but sheep are still vital to the local economy. Known as Romneys, these sheep are famed for their long wool and hardiness. The Romney Salt Marsh lamb is also highly prized for its rich, sweet meat. For centuries, wool was subject to heavy taxation, which encouraged smuggling. From the 13th century, wool was taken out of the country illegally. By the 17th century, the problem was so bad that the death penalty was introduced for the offence. It was a two-way trade. The boats used to smuggle out the wool came back laden with brandy, tea, and tobacco, all of which avoided duty. The smugglers were known as Owlers, from the noises they made to communicate. Their illicit ways became an inspiration for several authors. One of the best known was Russell Thorndike who wrote a series of adventure novels. These were tales of derring-do about the fictional Doctor Syn, a local vicar who doubled as the leader of a smuggling band in the late 1700s. The headquarters for law and order on the Marsh was Dymchurch, four miles north of New Romney. Its name comes from deme, a medieval word meaning judge. Justice was meted out by the Lords of the Levels, the Marsh’s governors at the 16th century New Hall and Gaol in the High Street. The head magistrate was known as the Leveller of the Marsh Scotts, a scot in this context being a payment. As well as dealing with smugglers, one of the magistrates’ jobs was to enforce a scot tax to maintain the sea walls, but those just outside the parish boundaries didn’t have to pay. Instead they got off ‘scot free’. Situated on the eastern coastline of the Marsh, Dymchurch owes its existence to the gradual draining of the marshes. In a natural action known as longshore drift, sediments such as clay, silt, sand and shingle were carried along the coast at an angle to the shoreline. At Dymchurch this built into a large shingle and sand bank, behind which the marshes gradually became dry land. By the time the Romans invaded in the first century AD, Dymchurch was a shingle spit, protecting their harbour at Portus Lemanis, five miles to the north. The Romans produced salt from works at Dymchurch, where today discoveries of coins and a cremation site bear testament to their presence. There has been a sea wall here since the 15th century, protecting the marsh from flooding. It was reconstructed between 1840-47, heightened again in 1971 and was rebuilt in 2011. Today the stepped concrete structure leading to an arching wall provides a pleasant promenade alongside the sandy beaches, but its protective role is still essential. The village, with its population of around 4,000, stretches parallel to the beach and the wall. A mixture of old cottages sit among more modern buildings. It is a settlement that has long attracted writers and artists. The squat, whitewashed 15th century Dormer Cottages in the High Street have been home to Noël Coward and Edith Nesbit, the author of The Railway Children. Another resident was the artist Paul Nash, whose Modernist seascapes painted in the first half of the 20th century often featured Dymchurch wall. The sea wall was not the only construction in the town built to protect the land. This time it was not the sea that was the enemy, but instead the threat of French invasion during the Napoleonic Wars. Three round 40ft (12m) high Martello towers stand guard set slightly back from the wall. They are part of a total of 103 Martellos originally built at regular intervals along the south coast from Sussex to Suffolk. Number 25, at the southern end of the village, is empty, but number 24 in the centre of Dymchurch between the High Street and the beach, has been fully restored. It is owned by English Heritage and free to enter, by appointment. The third, number 23, is just north of Dymchurch and is a private residence. The invasion never materialised. Instead the towers were taken over by the coastguard in a bid to combat the area’s endemic smuggling. Today, Dymchurch is one of the stops on the Romney, Hythe and Dymchurch Railway. This 15in gauge railway runs 90-year-old one third size steam trains the 131/2miles from Hythe along the coast to Dungeness. The occasional hoot can be heard before the train puffs into sight at the small station in Dymchurch. The line opened on 16 July 1927, as a public railway. 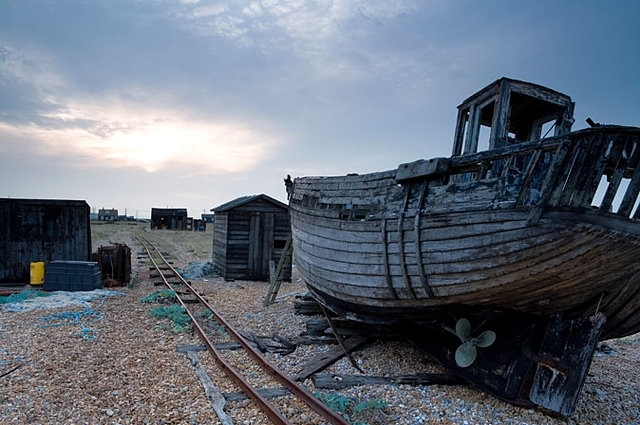 Today, its passengers are mainly visitors who enjoy the hour-long trip from Hythe to Dungeness. There are six main stations, of which New Romney is the fourth along the line from Hythe. This is home to the visitor centre and café. Inside, there is a detailed history, a model railway exhibition and photos of visiting dignitaries including the Queen, and Laurel and Hardy. Outside, there is a bustle of trains, visitors taking pictures and people, some volunteers, in overalls polishing its fleet of 10 locomotives. 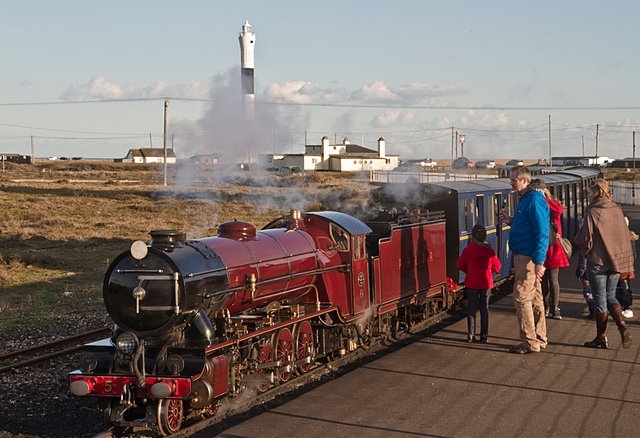 Travelling at approximately 25mph, the train runs south through the coastal villages of Greatstone-on-Sea and Lydd-on-Sea. It then crosses open shingle to the two Dungeness lighthouses and the power stations. Fishing boats and huts are scattered across the wide shingle beaches. Homes, many built from discarded railway coaches, have seemingly washed ashore at random intervals. Many are holiday homes, but a number are lived in all year. The most recent of the two lighthouses was built in 1961, but the one that attracts attention is the 1904 Old Lighthouse. The ascent of the 169 steps to the Lantern Room is rewarded with the sight of its two-ton circular lens that used to float on a mercury base. In the 1960s, the Dungeness nuclear power station was built. This blocked much of the Old Lighthouse’s light, prompting the construction of the new lighthouse. The power station dominates the view from Dungeness village. On clear days, these vast concrete structures can be seen from as far away as Eastbourne, 40 miles west along the coast. Four miles north of Dungeness, along Coast Drive and The Parade, is Greatstone and its strange sound mirrors. These massive concrete structures were built between 1928 and 1930 as listening ears for enemy aircraft. They were designed to concentrate the sound of incoming aircraft. But as planes became faster their effectiveness declined. The introduction of radar rendered them fully obsolete in the late 1930s. They still stand and can be visited on a guided walk run by the Romney Marsh Countryside Project. A half-a-mile walk east from the Dungeness railway station leads past one of the most influential gardens of the 20th century. This shingle plot, incorporating natural materials, native plants and sculpture made from rusting metal objects, was a total contrast to the pruned and preened gardens of the time. It surrounds a dark timber cottage with yellow trim, once home to film director Derek Jarman. He created the garden using what he found around him. There is flotsam washed up on the beaches, shells and native plants that grow well in salty shingle areas, such as sea kale and cornflowers. It is not open to the public, but can be seen from the road. Leaving the solitude of the marshes behind, and crossing the East Sussex border, the traveller arrives at Rye. This medieval town is one of the best preserved in the country and breathes history. Along its cobbled streets, ramshackle Tudor timber-framed buildings sit next to Georgian mansions. Little, dark alleyways connect the streets that today are filled with antique shops and delicatessens, art galleries and tea rooms. Walking from Glass Etc, on Rope Walk, a left turn on Tower Street leads to Landgate. Built in 1329, this is the only gateway to the town still standing. During the 14th century, at the time of the Hundred Years War, Rye was attacked several times by the French. Its wall defences cut off the town to the north and west, while the cliffs on the east and south side provided a natural barrier. Part of the wall can be seen from the car park along Cinque Ports Street. South along Hilder’s Cliff directly above Landgate, is Rye Castle Museum, full of stories from the town. It contains a range of locally made Hopware, pottery inspired by Kent’s hop industry. Depicting hop vines and cones, it was popular between the 1870s and 1930. At the top of the cobbled Pump Street is Ypres Tower, the oldest building in Rye open to the public. It was built as a fort in 1249 and has since been a court, a private residence, and from 1494 to 1891 a rather grim prison. Today, displays include a smuggler’s lantern, a model of the moving coastline of Romney Marsh and a well-maintained herb garden. Past St Mary’s Church, is another picturesque cobbled road, Mermaid Street. This is lined with a cornucopia of architectural styles, some dating back to the 1400s. The best known building is The Mermaid Inn that has stood here since 1420. In the mid-1700s a feared group of smugglers, known as the Hawkhurst Gang, met here to plan their skullduggery. Down Mermaid Street towards the bustling quay, still replete with fishing vessels, is Rye Pottery on Wish Ward. Dating back to 1793, it was celebrated throughout the 19th and 20th centuries for producing fine ceramics by hand using a 17th century technique known as Faience or Delft. After the Second World War, the Cole brothers took it on, creating a reputation for cutting-edge designs. Today, it is run by their descendants, siblings Tabby and Josh Cole. “Rye has been known for pottery since medieval times,” says Tabby. “The locals are incredibly proud of this heritage. Since 1947, we have been training local people in the process. One paintress joined around that time at 15 and now she’s trained generations of decorators. For 200 years, the pottery has been making Sussex Pigs. These were originally celebratory drinking vessels, with the pig’s head used as a cup while the body held the beer. “They are only made here and they are now in museums around the world,” says Tabby. From the busy cobbled streets of Rye, full of history and character, to the otherworldliness and solitude of Romney Marsh, this is an area that offers sharp contrasts. Winter provides the perfect opportunity to explore this area of open skies, wide horizons and historic settlements at its most atmospheric. The feature on the Romney Marshes appeared in the Jan / Feb 2016 issue of LandScape. For back issues click here. Or to subscribe to LandScape, click here.